These decreased levels of concern are fairly uniform across demographic groups—no group saw an increase on this metric over the last three years. And while there are few differences on this question with respect to income, education, race or gender, age remains an important predictor of concern. 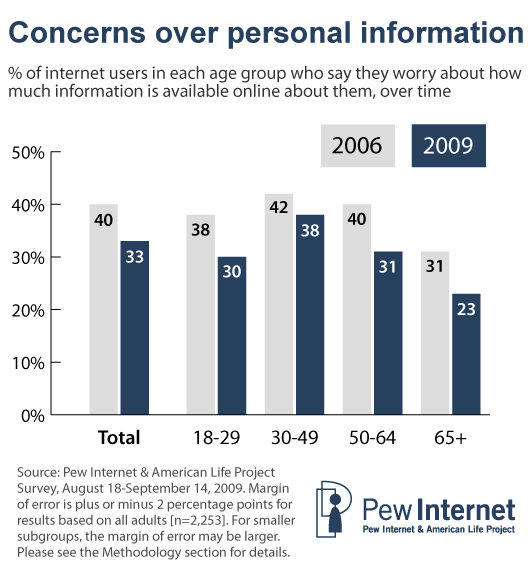 Among age groups, internet users ages 30-49 are the most likely to worry about the amount of information available online: 38% say they are concerned, compared with 30% of users ages 18-29, 31% of those ages 50-64 and 23% of those 65 and older. However, it is important to note that the results from this question are not a measure of internet users’ overall views on “privacy” or the extent to which they wish to have control over their personal information online. A relative lack of concern about the availability of personal information online does not necessarily translate into inaction. Indeed, many of the least concerned internet users have still taken steps to restrict what they share with others. For example, two-thirds of all SNS users (65%) say they have changed the privacy settings for their profile to limit what they share with others online. Among SNS users who worry about the availability of their online information, fully 77% have changed their privacy settings. However, even those who don’t worry about such information are relatively active in this regard—59% of these less concerned SNS users have adjusted their privacy settings in this way. It’s also the case that very few internet users have experienced reputational missteps online, which may contribute to their relatively low levels of concern. Only 4% internet users report having bad experiences because embarrassing or inaccurate information was posted about them online (unchanged since 2006). Even among the highly visible “public personae” population that is required to self-promote online, just 6% report a bad experience due to embarrassing or inaccurate information being posted online. Likewise, just 8% of all adult internet users have asked that information that was posted about them online be removed, which is virtually unchanged from the 6% of internet users who reported these requests in 2006. And for the first time, we asked social networking users about their own role in sharing undesirable material; just 12% of social networking users say they have posted updates, comments, photos or videos that they later regret sharing. The percentage of internet users who take steps to limit the information available about them on the internet has also declined, albeit by a slightly smaller margin. One-third (33%) of internet users take steps to limit the amount of information available about them online, down from 38% of such users in December 2006.21 Young internet users (those ages 18-29) remain the most likely group to limit the information available about them online—45% did this in December 2006, and 44% do so now. 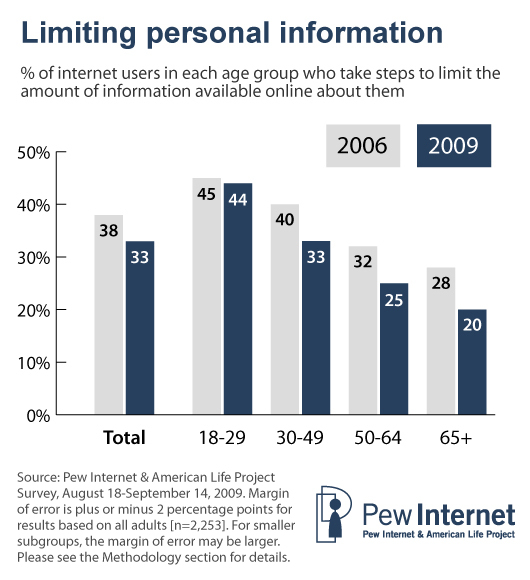 When compared with other age groups, young adults are the only group that remains just as likely to limit their online information as they were in 2006. Older age groups are not only less likely than young adults to say that they limit their information, but they have become less likely to do so over time. In the latest survey, 33% of 30-49 year olds, 25% of 50-64 year olds and 20% of those 65 and older said they take steps to limit their information online. That compares to 40% of 30-49 year olds, 32% of 50-64 year olds and 28% of those 65 and older who said they take steps to limit their information in 2006. There are few differences on this question with respect to income, education, race or gender. Likewise, the only difference relating to geography is the finding that suburban internet users (35%) are a marginally more likely to say they take steps to limit the amount of information available about them when compared with rural users (26% of whom do so). Wireless and broadband users are no more concerned, but are more likely to limit the amount of information available about them online. Interestingly, while both wireless and broadband users are more likely to take steps to limit their personal information they are no more likely than other internet users to be worried about how much information is available about them online. Some 36% of home broadband users take steps to limit their personal information (compared with 24% of dialup users), while 35% of wireless users limit their personal information (compared with 27% of stationary internet users). Those who know more, worry more. Worries about the availability of personal information and taking steps to limit that information are tightly linked with the amount of searching (both personal searches and searches about others) one takes part in. In our 2006 survey, those who searched their own name were just as likely to worry about how much information is available about them online as were those who did not self-search.22 Now, those who self-search are significantly more likely than those who do not search to worry about their online footprints (37% vs. 27%). Yet, self-searchers have not become any more likely to express concern as time has progressed. In 2006, 40% of self-searches said they were worried about the amount of information available about them online, and 37% reported the same in 2009. The overall drop in those who say they worry about the amount of information available about them on the internet is primarily among those who have never used a search engine to look up their own names online. Chances are, if you haven’t bothered to Google your name by now, you don’t spend much time fretting about your digital footprints. And those who express concern are twice as likely to say they take steps to limit the amount of information available about them online. Those who express concern about the amount of information available about them online are far more likely to take steps to limit access to that material; 53% of those who worry also take steps to limit, compared with just 23% of internet users who do not express concern. This finding is unchanged since 2006 when 54% of those who were worried said they took steps to limit access to information about them. However, concern about and limitation of information do not always go hand in hand. Among internet users who say they worry about how much information is available about them online, 45% say they do not take steps to limit the amount of information accessible to others online. At first glance, this finding seems to suggest an inherent contradiction. Wouldn’t those who are less visible online be the ones doing the most to limit their information? However, analysis of multiple questions on our survey implies quite the opposite. Those who are the most engaged online have more material to manage and therefore need to be more proactive in limiting that information—whether that means changing the default privacy settings on a social networking profile or requesting that inaccurate information be removed from a website. The more active people are in searching for results connected to their names online, the more likely they are to take steps to limit that information: Internet users who search for their own name are more likely to limit the information available about them online than those who do not (39% vs. 24%). Those who report the most information being available about them online are also the most likely to say they take steps to limit what is accessible: Those who report the widest range of information being available about them (at least 5 of the 11 items we asked about) are considerably more likely to say they take steps to limit their information than are those who report only 1 or 2 items being available (43% vs. 30%). Those who search for information about others are more than twice as likely as non-searchers to limit their personal information than those who do not (39% vs. 17%). And the more often a user searches for information about others, the more likely she is to limit access to her own personal information. Among people searchers who say they look for information about others at least every once in a while, 46% say they take steps to limit the amount of content accessible about themselves online. That compares with just 33% of those who have searched for information about others only once or twice. Social networking users are no more concerned, but are more likely to limit the amount of information accessible to others online. Social network users are no more or less likely than non-users to worry about the availability of information about them online (32% for SNS users, 34% for non-users). However, profile owners are consistently more likely to take steps to limit their personal information (41% do this, vs. 26% of non-users). The gap between SNS users and non-users has actually decreased significantly since 2006 when it comes to limiting personal information online. In 2006, the difference between users and non-users on this question was 23 percentage points (57% vs. 34%); now the gap is 15 points. In other words, compared with the general online population, users of online social networks are now less likely to limit their personal information online than they were three years ago. Those who worry about how much information is available about them online are roughly as likely to post comments, queries and other information online (using a real name, a screen name, or anonymously) as those who do not worry about their personal information—57% vs. 52%. However, those who take steps to limit their personal information are much more likely to post online—69% of these internet users have posted something online, compared with 47% of those who do not take steps to limit their personal information. And within the universe of content posters, those who take steps to limit their personal information are generally less likely to use their real names (40% usually do so, compared with 49% of posters who do not take steps to limit their personal info) and more likely to use a screen name (46% vs. 38%). Content posters who limit their personal information and those who do not are equally likely to post anonymously (10% vs. 7%). If your boss is watching, you’re more likely to be watching, too. As noted above, overall, 12% of employed adults say they need to market themselves online as part of their job. These public personae who are required to self promote online are more proactive in monitoring their online identities than those who do not have this kind of professional obligation. Fully 84% of those who say they need to post information about themselves online as part of their job use a search engine to look up their own name, which is up significantly from 68% in 2006. Among other employed internet users who are not required to market themselves online, just 55% use search engines to find results connected to their name. Again, as in 2006, public personae are more active in monitoring and managing their digital footprint; 44% of those who follow their footprints via search engines say they do so at least every once in a while. Among other employed internet users, only 20% do so with the same level of frequency. The greater level of vigilance among public personae is also illustrated by a greater likelihood to limit the amount of information available about them. Four in ten (42%) of these “public personae” say they take steps to limit their personal information compared with 32% of other employed internet users. However, public personae are no more likely to worry about the amount of information accessible about them online. However, those whose workplaces have explicit policies about employees’ presence online do express slightly higher levels of concern; 41% of those who work for a company with a policy about how employees should present themselves online worry about the information that is available about them (vs. 29% of those whose companies do not have such policies). The difference in limiting behavior is slightly less pronounced; 39% of those with company policies about self-presentation online take steps to limit their personal information compared with 31% of employees whose companies do not have such policies. Just 4% of internet users report bad experiences because of embarrassing or inaccurate information online. High levels of confidence among internet users may, in part, be connected to personal experience. As was the case in 2006, the 2009 survey found that just 4% of adult internet users have had bad experiences because embarrassing or inaccurate information was posted about them online. Young adult internet users (18-29) are more likely than online adults ages 50 and older to report bad experiences of this kind; 7% of young adults say they have had negative experiences because of embarrassing or inaccurate information being posted about them, compared with just 2% of adults ages 50 and older. Those who worry about the amount of information available about them online are also somewhat more likely to report bad experiences (7% vs. 3% of those who do not worry). However, more than any other group, the 8% of internet users who have used online dating websites are the most likely to say they have had bad experiences. Fully 14% of online daters say they have had negative experiences because of embarrassing or inaccurate information posted online, compared with just 4% of those who do not use online dating sites. Those who worry about or limit their personal information online are more likely than those who do not to have had a bad experience online due to someone posting their personal information, although not by an overwhelming margin. Some 7% of internet users who worry about their personal information online have had a bad experience, vs. 3% of those who do not worry about their personal info. Similarly, 8% of those who take steps to limit their personal information have had a bad experience, compared with 3% of those who do not take steps to limit their online footprint. Close to one in ten internet users (8%) have asked someone to remove information about them that was posted online. Internet users are twice as likely to say they have asked someone to remove information about them as they are to say they have had a bad experience due to embarrassing or inaccurate information being shared. Among all adult internet users, 8% say they have asked someone to remove information about them that was posted on the internet, including things like photos or videos. By comparison, about the same number (6%) reported this in 2006. However, young adults are the only age group that has become significantly more likely since 2006 to say they have requested an information takedown. 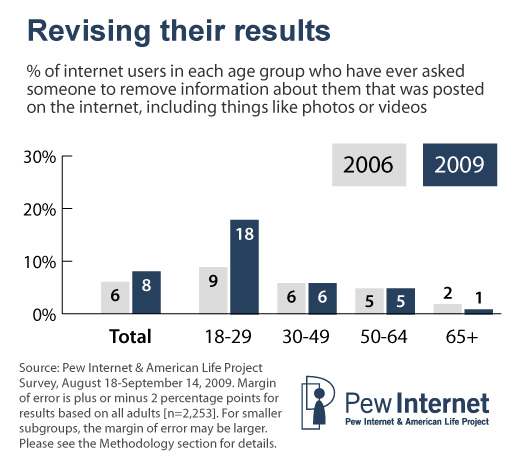 Close to one in five (18%) young adult internet users ages 18-29 say they have asked someone to remove information about them that was posted online, up from 9% in 2006. That compares to just 6% of users ages 30-49, 5% of those ages 50-64 and just 1% of those ages 65 and older who said they had requested an information takedown in the current survey (see chart below for comparisons to 2006). These age-related variations hold true among the social networking population as well. As we noted in our Social Media and Young Adults report, 46% of adult internet users say they have created a profile online that others can see on a social networking site like MySpace, Facebook and LinkedIn. Overall, 13% of SNS users have requested an information takedown, but 20% of SNS users ages 18-29 have made such a request. By comparison, 8% of SNS users ages 30-49 have asked someone to remove information about them and 9% of SNS users ages 50 and older have done this. Those who worry about their personal information or take steps to limit the content that is available about them online are more likely to say that they have asked others to take down information about them. Among those who worry about the amount of personal information available about them online, 13% have asked someone to take down something they posted (vs. 6% of those who do not worry); similarly, 16% of those who take steps to limit their personal information have asked others to take down information about them (compared with 4% of non-limiters who have done this). The vast majority of internet users who have requested a takedown were trying to get a photo or video removed. And most who sought removal of material were successful. The vast majority of those who have requested that some kind of information about them be taken offline say that their efforts are usually effective. Fully 82% report this, compared with 17% who say they are not usually successful at getting information about them removed. The number of people who have requested an information takedown is too small to make any meaningful comparisons of success rates across age groups or socioeconomic status. Among users of social networking sites, young adults are the most proactive in customizing their privacy settings and restricting who can see certain updates. Younger internet users are often associated with the idea that they prefer to share information rather than protect their privacy online. However, our data suggest that younger users are far more active and deliberate curators of their online profiles when compared with older users–perhaps out of necessity. 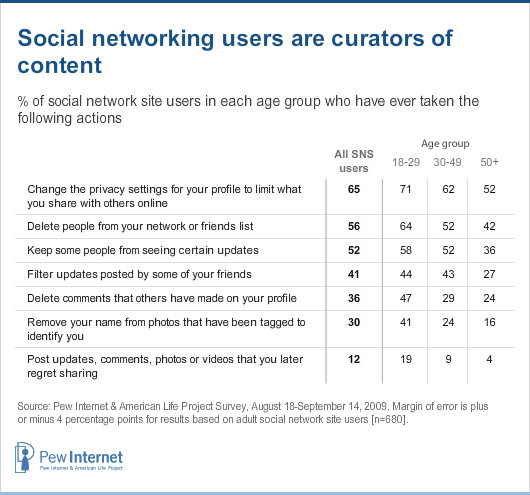 Nearly three-quarters (71%) of social networking users ages 18-29 have changed the privacy settings on their profile to limit what they share with others online. By comparison, 62% of SNS users ages 30-49 and just 55% of SNS users ages 50-64 have changed the default settings. Overall, 65% of adult SNS users say they have customized the privacy settings on their profile to restrict what they share. Likewise, half of all SNS users (52%) say they have restricted what they share by keeping some people from seeing certain updates. This could include creating custom friend lists or blocking individual users from seeing certain updates or content. For this question, there was less variation among those under age 50. While 58% of SNS users ages 18-29 keep some people from seeing certain updates, 52% of those ages 30-49 do this, compared with 37% of SNS users ages 50-64. Yet, young adults are by far the most likely to say that they have posted content to social networking sites that they later regret sharing. Looking at the adult social networking population as a whole, relatively few users (12%) say they have posted updates, comments, photos or videos to the sites that they later regret sharing. However, among SNS users ages 18-29, that number jumps to 19%, while just 9% of those ages 30-49 and only 5% of those ages 50-64 say they have had this experience. When asked if they ever tried to remove any of the information that they regretted sharing, about eight in ten of these remorseful users said they had attempted to take that content down. Young adults are also the most likely to delete unwanted comments and tags associated with their profiles. Managing an online identity requires more than just making good decisions about the material you share and who you share it with. It also requires monitoring and refining the content that others post about you. Among social networking users, more than a third (36%) say they have deleted comments that others have made on their profiles. Again, young adults are far more engaged in this regard. Half (47%) of young adult SNS users have deleted comments that others have made on their profile, compared with just 29% of SNS users ages 30-49 and 26% of those ages 50-64. Similarly, 41% of SNS users ages 18-29 say they have removed their name from photos that were tagged to identify them, compared with just 24% of SNS users ages 30-49 and only 18% of those ages 50-64. Overall, 30% of adult SNS users say they have removed tags that identified them in photos. In 2009, the term “unfriend” was chosen as the Oxford Word of the Year and defined as the action of removing someone as a ‘friend’ on a social networking site such as Facebook. While “friending” someone on a social networking site assumes a certain level of persistence in that connection, relationships in the offline world are dynamic and may go through periods of dormancy or end altogether. Indeed, 56% of social networking users say they have deleted people from their network or friends list. Once again, young adults are the most experienced in this form of management of their social network: 64% of SNS users ages 18-29 have deleted people from their network or friends list, compared with 52% of those ages 30-49 and just 41% of users ages 50-64. While some friends get deleted from others’ networks, others are simply tuned out. Features such as the “Hide” function on Facebook facilitate this kind of filtering, essentially omitting certain friends’ updates from a user’s News Feed. Overall, 41% of social networking users say they have filtered updates posted by some of their friends. SNS users ages 18-29 are equally as likely as those ages 30-49 to say that they filter updates from their friends (44% vs. 43%). However, SNS users ages 50-64 are significantly less likely to utilize this feature (30% say they filter). Young adult users of social networking applications are not only the most proactive in customizing their privacy settings and limiting what they share via their profiles, but they are also generally less trusting than older users of the sites that host their content. When asked how much of the time they think they can trust social networking sites like Facebook, MySpace and LinkedIn, 28% of SNS users ages 18-29 say “never.” By comparison, a smaller segment of older users express such cautious views; 19% of SNS users ages 30-49 and 14% of those ages 50-64 say they never trust the sites. While younger generations have historically been associated with lower levels of trust overall, those ages 18-29 were not any more likely than older adults to express low levels of trust in this survey.24 The responses to this question are also significant when seen within the context of the social networking site user population as a whole.25 Among SNS users, when asked a general question about trust in people (“Generally speaking, would you say that most people can be trusted or that you can’t be too careful in dealing with people?”)—there are not significant variations in levels of trust by age. For instance, 57% of SNS users ages 18-29 say “you can’t be too careful” in dealing with people, compared with 58% of SNS users ages 30-49. Among social networking users ages 50 and older, 50% express this cautious view (a difference that is not significant when compared with younger users). Likewise, young adult SNS users are no less trusting of an array of other organizations, and are actually more trusting of news websites when compared with older SNS users. 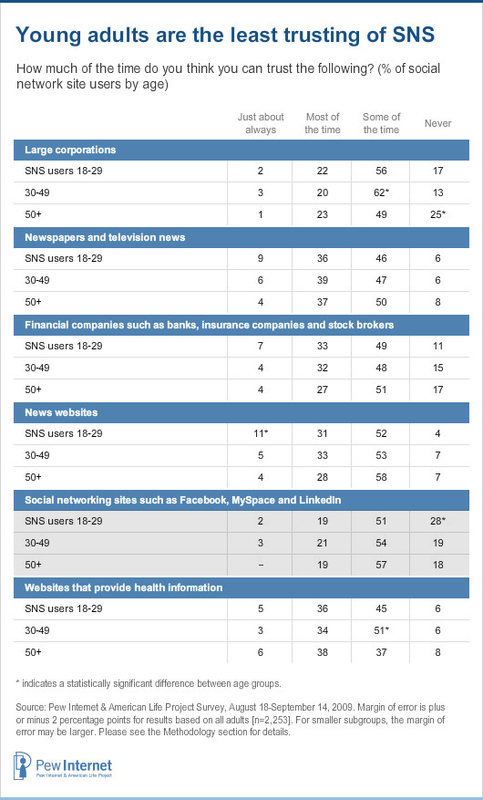 While 42% of SNS users ages 18-29 say you can “just about always” or “most of the time” trust news websites, only 32% of SNS users ages 50 and older express the same level of confidence. When asked about their levels of trust in other kinds of organizations—including large corporations, newspapers and television news, financial companies and websites that provide health information—young adult SNS users express views that are not significantly different than their elder SNS-using counterparts.